UNIVERSITY PARK — Penn State will be without running back and kick returner Saquon Barkley, who was selected by the New York Giants with the second pick in the first round of the NFL Draft. Coach James Franklin will have to fill the entire secondary after the departure of Marcus Allen, Troy Apke, Christian Campbell and Grant Haley, all of whom are trying to make the roster of NFL teams. How will the defense perform this season? Is the offensive line any better than it was last season? How will the Lions make up for the loss of Mike Gesicki? The tight end is having a big preseason with the Miami Dolphins. Who will be the kicker after the departure of Tyler Davis? 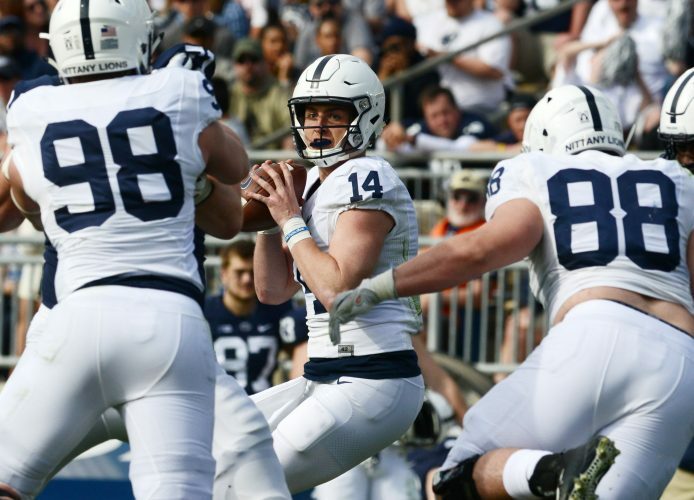 How will the Nittany Lions do against a rugged schedule, which includes home games against Ohio State, Michigan State and Wisconsin? How many more bruises will Franklin sustain from playing paintball? All of those questions are factors when predicting how the Lions will do this season. The Mirror asked 16 media members at Saturday’s Penn State media day for their predictions, and they were split exactly between 9-3 and 10-2. The Lions went 10-2 during the regular season in 2017, and they finished 11-2. They were all asked to give a comment to back up their picks, which you will see below. Many said that the Sept. 29 game with Ohio State is a huge game. Some said fans should be wary of the Nov. 3 game at Michigan, which will be followed by the home game against the Badgers. Peter Terpstra, WTAJ-TV: 10-2. Comment: “I think they roll through the first four. Ohio State is going to be a massive game, and I think they’ll beat Ohio State. I think by that time of the season the defense is going to have things figured out. Your biggest chance for a letdown is Michigan State on homecoming. I think they’ll lose to Wisconsin, as well.